Product prices and availability are accurate as of 2019-04-17 16:47:18 EDT and are subject to change. Any price and availability information displayed on http://www.amazon.com/ at the time of purchase will apply to the purchase of this product. 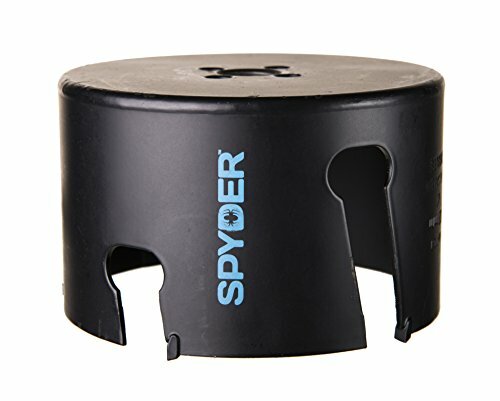 Spyder Rapid Switch and Rapid Core Eject Hole Saw System is a faster, easier and smarter hole saw system The New Spyder Hole Saws with patented, innovative Rapid Switch and Rapid Core Eject features make cutting holes a snap. Just push the button on the blade's integrated arbor to move the hole saw on or off the pilot drill. Push the button again and slide back the adapter to take out the plug. You can even cut holes at an angle and easily enlarge existing holes. No other system is so efficient. With Spyder Rapid Switch and Rapid Core Eject features, it's the most efficient hole saw system ever made. You can change diameter with one click and Quickly install or remove saw diameters. Just push the button to slide one hole saw off and slide another one on. To drop out the core you simply push the button and slide the blade back to remove the plug. No screwdriver required. You can even cut at an angle, just click and pull the hole saw back to extend the pilot drill's length enough to cut at an angle. Release to complete the hole. You can also enlarge holes that were drilled too small, just use your hole saw as a guide to turn a small diameter hole into a larger one by using a wider diameter saw. New Rapid Core eject holes saws allow you drop out the core at the touch of a button Carbide tipped for exteneded life and clean cuts Cuts 5x faster than standard hole saws Cutting depth of up to 2"